Life in the Clouds: Otto Perez: Real Change or a Return to Military Rule? Otto Perez: Real Change or a Return to Military Rule? 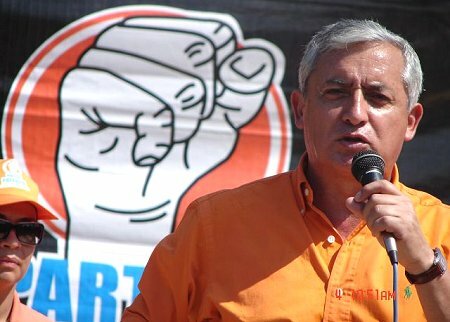 On November 6th, Otto Perez Molina of the Mano Duro Party was elected the new president of Guatemala. As the already unstable government prepares to turn over a new leaf, many wonder what changes lie ahead for this crime-ridden country. Today's blog comes to you from Brendan Crow, a month-long volunteer that's helping us run our summer camp program. What's different about General Otto Perez Molina and what direction will the country take now? There has been much discussion about the 2011 Presidential Election in Guatemala, but many are reluctant to get their hopes up with the recent election of Otto Perez. The country has struggled to get back on track ever since the US organized coup of 1954 to oust the democratically elected president, Jacobo Árbenz. Though after multiple military dictatorships, Guatemala has returned to a more democratic forum. Despite the outspoken effort and promises by those in power today, the country still suffers from extreme poverty and one of the highest homicide rates in the world. With Otto Perez now at the head of the government, many hope for a decrease in the crime rate but not many believe he will bring change to the root problems of Guatemala. Perez, or Major Tito, as was the pseudonym Perez used as a mid-level commander for the Guatemalan Military in the 1980s, was the head of military intelligence in the Quiche department. During the violence, Quiche suffered the greatest number of atrocities but very little documentation has been found to understand Major Tito’s involvement in the violence (video). Perez still stands by the government’s actions during the violence claiming that his job was to win back the confidence of the people through constructive means. Several survivors of the violence claim he ordered the torture of suspected guerrillas and led the massacre of several villages in the Quiche department. In 1982, revolutionary militant groups united to form the URNG (Guatemalan National Revolutionary Unity) and started a long series of peace talks. Fourteen years later in 1996, the Guatemalan Peace Accords were signed by the URNG and the government, including General Otto Perez Molina, who represented the military at the time. By signing the Peace Accords, both sides agreed to drop arms and reach goals through peaceful means. Ultimately, the Peace Accords had some success during the following year in 1997. A new structure created 3 levels of committees to increase involvement from Mayan communities in the democratic process in Guatemala. However, lines of permanent communication between the largely rural population and the government never developed and funding for the changes quickly dried up. Shortly after voting for change in critical areas of civil society, those in elected positions lost interest in implementing initiatives agreed upon a year earlier. Focus quickly turned to the impending election in 1999. Power today remains centered in the capital with little regard for the rural towns and villages. All candidates throughout the electoral cycle this year mentioned the Peace Accords and Millennium Development goals but none were really willing to talk openly about them. The government pledged that the Peace Accords were widely distributed throughout the country, but actual awareness and understanding has a long way to go. With 22 different Mayan languages spoken and a literacy rate of 69%, publishing the document is hardly enough. Amidst the evidence from Otto Perez's violent past, there is also evidence of hope. His actions in the 1980s to oust one of the most brutal dictators, Rios Montt, show that he has courage to stand for what is right. Following that, in 1992, he stood against President Jorge Serrano when he tried to dissolve congress and suspend the constitution. Finally, he is proud to list the Peace Accords as one of the accomplishments on his resume, despite the lack of progress in implementation. Recently, in his campaign he focused on a return to justice as part of his ‘firm hand’ against violence and drug trafficking. He recognizes that the challenge is steep with the rate of prosecution for violent crimes at an abysmal 2%. That said, the recent success of attorney general Claudia Paz y Paz to prosecute ex-military officers for the crimes against humanity will also be a measure of where Perez’s loyalty and support lie. Hopefully with time we'll see him put his words into action, and do more than just declare war against violence and drugs.